The Elder Scrolls Blades is coming in early 2019, in case you thought it still might hit "fall"
The Elder Scrolls Blades has been delayed, proving that It's the most wonderful time of the year for family, warm drinks, and games with vague release dates to sheepishly confirm they're not coming out yet. Bethesda said as recently as September that Blades would arrive in "fall", via an Apple Event stage presentation hosted by Bethesda Game Studios director Todd Howard, but the silence had been adding up since then. Bethesda revealed on the series' official Twitter account that The Elder Scrolls Blades is now planned to hit mobile devices sometime in early 2019. If you haven't been following it, The Elder Scrolls Blades is a free-to-play, mobile-centric offshoot of the fantasy series that brought us Skyrim, Skyrim Special Edition, Skyrim VR, and The Elder Scrolls 1 through 4. 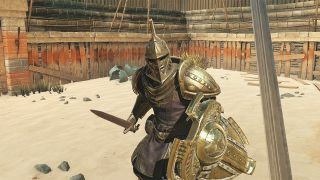 Blades players use touch controls to explore dungeons and wilderness from the usual first-person perspective, while locked-in combat and town building elements bring in some more familiar mobile trappings. All that said, Bethesda noted when it first announced Blades that the game would also likely come to PC and consoles after arriving on iOS and Android. The delay announcement makes no mention of those other versions, but it seems fair to assume that they're still in the cards (albeit even further out now than they were before). We got some hands-on time with Blades back at E3 2018 where we found it smooth to play and quite promising overall. Hopefully this delay is just to ensure an even better experience when it arrives - Akatosh knows Bethesda's confidence might be a bit shaken after launching Fallout 76. While you wait, why not freshen up your play experience with some picks from our list of the best Skyrim mods?